Quite often the impersonal and the personal psyche are even in direct opposition. There are hundreds of examples which demonstrate to the psychologist that two souls live in every man. Exercising their imagination—which I call the mother of human consciousness—many of my patients painted pictures and described dreams which displayed a strange conformity with definite laws and showed peculiar parallels to Indian and Chinese temple, images. Where were these people supposed to have obtained knowledge about the ancient temple cultures of the Far East? I have treated patients who had visions about events which happened hundreds of years ago. All this can come only from the unconscious, the impersonal soul, the finished brain of the new born in Contemporary man is but the latest ripe fruit on the tree of the human race. None of us knows what we know. ~Carl Jung [Interview in 1932 found in C.G. Jung Speaking; Pages 57-58. What the ancients did for their dead! You seem to believe that you can absolve yourself from the care of the dead, and from the work that they so greatly demand, since what is dead is past. You excuse yourself with your disbelief in the immortality of the soul. Do you think that the dead do not exist because you have' devised the impossibility of immortality? You believe in your idols of words. The dead produce effects, that is sufficient. In the inner world there is no explaining away, as little as you can explain away the sea in the outer world. You must finally understand your purpose in explaining away, namely to seek protection. ~Carl Jung; Red Book. "My advice to you, whoever you may be, Oh you who desire to explore the Mysteries of Nature; if you do not discover within yourself that which you seek, neither will you find it without. If you ignore the excellence of your own house, how can you aspire to find excellence elsewhere? Within you is hidden the treasure of treasures. Oh Man! Know thyself, and you will know the universe and the Gods. we have seen. It should, therefore, be understood as an act of becoming conscious." "You are an image of the unending world, all the last mysteries of becoming and passing away live in you. If you did not possess all this, how could you know?" The mind which is in each of us is able to comprehend all other things, but has not the capability of understanding itself. For as the eye sees all other things, but cannot see itself, so also the mind perceives the nature of other things but cannot understand itself. For if it does, let it tell us what it is, or what kind of thing it is, whether it is a spirit, or blood, or fire, or air, or any other substance: or even only so much whether it is a substance at all, or something incorporeal. Are not those men then simple who speculate on the essence of God? For how can they who are ignorant of the nature of the essence of their own soul, have any accurate knowledge of the soul of the universe? For the soul of the universe is according to our definition, -- God. ~Philo the Jew; Allegorical Interpretations I. In order for an ego to serve the mandates of the Self (that life be lived, that humans and God partner in the evolution of the Creation), there has to be a relationship. Relationality is the feminine aspect of the Self. Invite the story back into your life. Wisdom requires sacrifice and the courage to take action, regardless of how the collective views it or what the consequences might be. Wisdom is always available to the ego and both Wisdom and ego are in relationship with God (the Self). The question is—can the ego hear the generative voice of Wisdom, or will it be possessed by unassimilated archetypal contents of the unconscious? Myths matter because they are the collective dreams that wed inner and outer, people and places, known and unknown. Alchemy facilitates our personal development by amplifying natural processes heated by conscious intention, love, and a personal confrontation with the unconscious. Jung says this leads to self-knowledge: a transcendent relationship with the unconscious and freedom from the duality of the opposites, such as time and space. Spirituality is not a religion but means you are in touch with your own self. The spiritual path is not to be followed by rising upward through one's head toward a heaven in the sky, but through the personal and then tribal and then collective unconscious, downward and inward, through deeper and deeper layers of our own inner darkness, finally breaking through to eternity and light. We become our authentic self – the true gold of the alchemists. Jung saw the psyche as an inherently more spiritual and fluid place, an ocean that could be fished for enlightenment and healing. The purpose is to give life back to someone who’s lost it. Our conscious mind is limited to the sequential flow of words and their corresponding ideas which arise from our subconscious. Our subconscious mind being formed from knowledge and experiences gathered over our lifetime (and possibly from the lives of our ancestors where knowledge is stored in genetic structures). 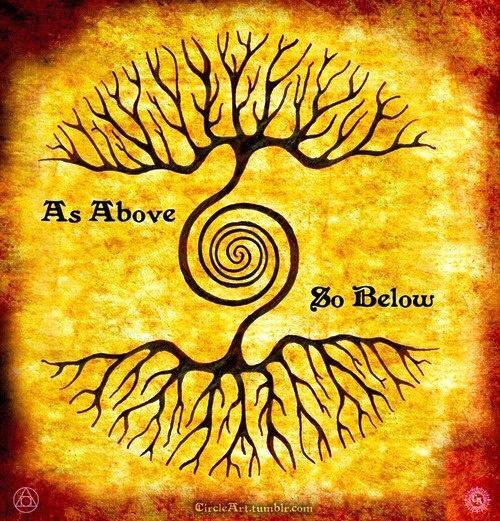 Thus if we are to have harmony between our conscious and sub-conscious minds and the external world we experience, we must unite these apparently separate things. To do to this at a fundamental level requires understanding what matter is and thus what we are (as humans) and how we are necessarily connected to all other matter in the universe. ~Carl Jung. "My life often seemed to me like a story that has no beginning and no end. I had the feeling that I was a historical fragment, an excerpt for which the preceding and succeeding text was missing. I could well imagine that I might have lived in former centuries and there encountered questions I was not yet able to answer; that I had been born again because I had not fulfilled the task given to me.” --Carl Jung. I: And the crown? Solve the riddle of the crown for me!" Soul Bird: "The crown and serpent are opposites, and are one. Did you not see the serpent that crowned the head of the crucified?" I: "What, I don't understand you." Soul Bird: "What words did the crown bring you? "Love never ends" - that is the mystery of the crown and the serpent." 3. Out of opposites comes a distinction between I and not-I. The qualities identified with at this stage are not uniquely individual, but identified with the collective - beginning of the development of the Persona. 4. Persona development - copying others in order to ‘fit in’. 5. Re-cognizing the Persona (become conscious of the MASK). 6. Dissolution of the Persona - strictly by ‘act of will’. It all starts with the Blood - "If it bleeds, it leads". Ultimately, every individual life is at the same time the eternal life of the species. “My thesis, then, is as follows: In addition to our immediate consciousness, which is of a thoroughly personal nature and which we believe to be the only empirical psyche (even if we tack on the personal unconscious as an appendix), there exists a second psychic system of a collective, universal, and impersonal nature which is identical in all individuals. This collective unconscious does not develop individually but is inherited. I believe that we have the choice: I preferred the living wonders of the God. I daily weigh up my whole life and I continue to regard the fiery brilliance of the God as a higher and fuller life than the ashes of rationality. The ashes are suicide to me. I could perhaps put out the fire but I cannot deny to myself the experience of the God. Nor can I cut myself off from this experience. I also do not want to, since I want to live. My life wants itself whole. Therefore I must serve my self I must win it in this way. But I must win it so that my life will become whole. For it seems to me to be sinful to deform life where there is yet the possibility to live it fully. The service of the self is therefore divine service and the service of mankind. If I carry myself I relieve mankind of myself and heal my self from the God. I must free my self from the God, since the God I experienced is more than love; he is also hate, he is more than beauty, he is also the abomination, he is more than wisdom, he is also meaninglessness, he is more than power, he is also powerlessness, he is more than omnipresence, he is also my creature. ~Carl Jung; Red Book. My Soul, are you there? When I beheld the vision of the flood in October of the year 1913, it happened at a time that was significant for me as a man. At that time, in the fortieth year of my life, I had achieved everything that I had wished for myself I had achieved honor, power, wealth,knowledge, and every human happiness. Should I tell you everything I have seen, experienced, and drunk in? Or do you not want to hear about all the noise of life and the world? But one thing you must know: the one thing I have learned is that one must live this life. This life is the way, the long sought-after way to the unfathomable, which we call divine. There is no other way, all other ways are false paths. I found the right way, it led me to you, to my soul. I return, tempered and purified. Do you still know me? How long the separation lasted! Everything has become so different. And how did I find you? How strange my journey was! What words should I use to tell you on what twisted paths a good star has guided me to you? Give me your hand, my almost forgotten soul. How warm the joy at seeing you again, you long is avowed soul. Life has led me back to you. Let us thank the life I have lived for all the happy and all the sad hours, for every joy, for every sadness. My soul, my journey should continue with you. I will wander with you and ascend to my solitude." The spirit of the depths forced me to say this and at the same time to undergo it against myself since I had not expected it then. I still labored misguidedly under the spirit of this time, and thought differently about the human soul. I thought and spoke much of the soul. I knew In many learned words for her, I had judged her and turned her into a scientific object. I did not consider that my soul cannot be the object of my judgment and knowledge; much more are my judgment and knowledge the objects of my soul. Therefore the spirit of the depths forced me to speak to my soul, to call upon her as a living and self-existing being. I had to become aware that I had lost my soul. From this we learn how the spirit of the depths considers the soul: he sees her as a living and self-existing being, and with this he contradicts the spirit of this time for whom the soul is a thing dependent on man, which lets herself be judged and arranged, and whose circumference we can grasp. I had to accept that what I had previously called my soul was not at all my soul,but a dead system. Hence I had to speak to my soul as to something far off and unknown, which did not exist through me, but through whom I existed. He whose desire turns away from outer things, reaches the place of the soul. If he does not find the soul, the horror of emptiness will overcome him, and fear will drive him with a whip lashing time and again in a desperate endeavor and a blind desire for the hollow things of the world. He becomes a fool through his endless desire, and forgets the way of his soul, never to find her again. He will run after all things, and will seize hold of them, but he will not find his soul, since he would find her only in himself Truly his soul lies in things and men, but the blind one seizes things and men, yet not his soul in things and in men. He has no knowledge of his soul. How could he tell her apart from things and men? He could find his soul in desire itself but not in the objects of desire. If he possessed his desire, and his desire did not possess him, he would lay a hand on his soul, since his desire is the image and expression of his soul. In most cases it is impossible to explain to the others what has happened, for any understanding is walled off by impenetrable prejudices. "You are no different from anybody else," they will chorus or, "there's no such thing," and even if there is such a thing, it is immediately branded as "morbid"...He is at once set apart and isolated, as he has resolved to obey the law that commands him from within. "His own law!" everybody will cry. But he knows better: it is the law...The only meaningful life is a life that strives for the individual realization--absolute and unconditional--of its own particular law...To the extent that a man is untrue to the law of his being...he has failed to realize his own life's meaning.